A large proportion of the City’s new social housing is also out of reach for the 51,000 renter households who make below $30,000 per year and who are experiencing the brunt of the housing crisis. If “affordable housing is something that somebody can afford,” to quote Vision Vancouver Councillor Kerry Jang, who is that somebody? To make matters worse, these rental rates are also rising fast. For example, in 2014, the HILs rate for a bachelor was $875 and two years later it is almost $100 more. So to recap, under the new definition of social housing, 30% of units in any given social housing project have to rent just below average market rents, while the other seventy per cent of units can be rented for much higher. All of these units are counted in the City’s tally of 1,683 units of new social housing. Are new social housing units reducing homelessness? The result of these policies is that only 92, or 5.5%, of Vancouver’s 1,683 new social housing units are guaranteed to rent at the shelter rate, the $375 provided by the Province for welfare recipient’s rent. Meanwhile, 563 units, almost 33.5%, of the total social housing units have maximum rents set at HILs rates or above (you can download a breakdown of rent levels in the new social housing units here). It should be noted, first, that these are minimum numbers. To my knowledge, the City has only released vague statements about how many of these units might be available to people on welfare, such as “the extent to which shelter rate units can be delivered will depend upon the availability of funding from other sources” (from the Oakridge rezoning report) or “It is contemplated that up to fifty percent of the units would be affordable to those on social assistance and that the remaining fifty percent would be for lower end of market and rent geared to income levels” (from the 1107 Seymour rezoning report). Unfortunately, recent announcements from the City show that the availability of any of these “social housing” units for welfare recipients or even the working poor is far from assured. One of the largest social housing projects currently under construction is at 1551 Quebec, in which a developer will build and transfer to the City a 137-unit building in exchange for permission to build four condo towers. The 2014 rezoning report for the development included the exact same language about shelter rate units as in the Oakridge report. Earlier this year, however, the City announced the start of construction, declaring that a minimum income of $36,500 per year would be necessary to rent a unit in the new building: 40% of units will be made available to people making between $36,500 and $56,000, with the cheapest rent $913 a month. The other 60% of units will be “modest market” rentals, meaning “housing that is affordable to the middle third of incomes for the Greater Vancouver region,” currently those making between $40,000 and $80,000 per year. This translates into rent levels of $1,000 to $2,000 per month. All 137 units are counted in the City Report Card’s social housing tally. The City concludes its announcement about 1551 Quebec St. by stating that “through partnerships like this one, we are demonstrating success in creating affordable housing but we need both the Provincial and Federal governments to support our efforts to expand affordability.” Indeed, the social housing needed by the over 100,000 people facing homelessness will only come through government funded housing programs organized by the Province, Feds and City working together. That said, is this how the City wants to demonstrate “success” in building “affordable” housing? Projects that are unaffordable to the 38% of renters in Vancouver who make less than $30,000 will not solve our housing crisis. According to Mukhtar Latif, the CEO of the City-run Vancouver Affordable Housing Agency, speaking to City Council on May 31, operating a social housing building requires about $550 per month per unit. In developments like 1551 Quebec, capital costs are borne entirely by private developers. So why is the City charging minimum rents almost double the operating costs? 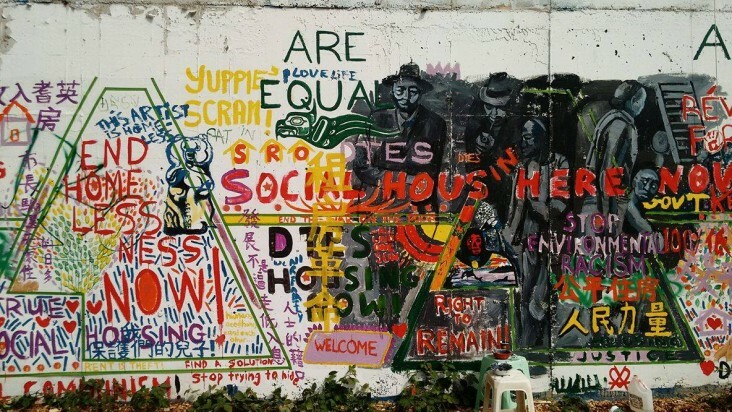 If social housing isn’t affordable, what is? We should also note that the City keeps a separate tally for “supportive housing,” which the City defines as “affordable housing that provides links to support staff who assist tenants to stabilize their lives, enhance independent living skills, and re-connect with the community.” These units, which are mainly funded by the Province, are generally intended for people with mental health or addiction issues and are not available for people who are simply poor. These units are also not fully covered by the Residential Tenancy Act, with some tenants subject to arbitrary room searches, enforced medication regimes, and restrictions on guests. The 2015 Report Card states that 1,844 units have been “enabled” since 2012. 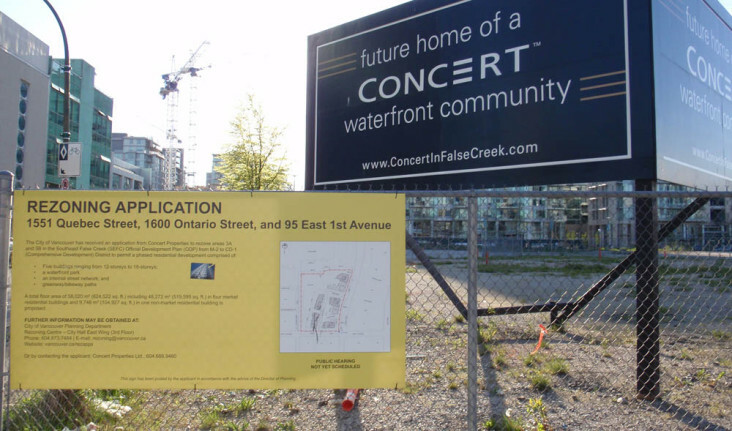 Of these units, 1,507 are the result of Provincial funding along with City grants of land for 14 sites in a program that City Council approved in 2007, before the election of Vision Vancouver. Four hundred and forty of these units were completed by 2011. The duplicity about timing and the issues around tenants’ rights notwithstanding, these provincially-funded units do legitimately provide housing for some of those most in need, the vast majority renting for shelter rates. Some additional supportive housing units are being built, often in projects that also contain units counted in the City’s social housing tally. For example, Atira Development Society is redeveloping the former United We Can bottle depot site into 52 units that will rent at shelter rates (counted in the City’s supportive housing tally), 68 units that will rent at HILs rates (counted in the City’s social housing tally), and 78 units of “market rental” in which studios will rent for $1,242 and one bedrooms for $1,561. Funding shelter rate units by charging market or near-market rents for other units could be a worthwhile strategy in the absence of Federal and Provincial funding, though there are legitimate concerns around gentrification from such projects as I discuss below. Regardless, what makes no sense is the City counting the 68 units that will rent for $963 and upwards as “social housing” that purportedly addresses homelessness. Currently, many of Vancouver’s poorest residents live in the approximately 4,500 private market single room occupancy hotels rooms (SROs), enduring substandard conditions including a lack of heat and hot water (e.g., at The Regent and the Lion Hotel). The City’s longstanding policy, reiterated in Part Two of the Report Card, calls for the replacement, over the long term, of SROs with social housing units. But given the fact that the vast majority of new social housing will be unavailable to people on welfare, the City should be doing everything it can to protect the low-income housing stock that already exists. In a few cases, projects that contain new social housing units have required the demolition of existing low-income housing in older apartment buildings and SRO buildings. For example, 1171 Jervis will provide 27 units of new social housing, in which “rents will range from the shelter component of Income Assistance to a maximum of the CMHC average market rent for the local area,” along with 58 condos that sold for between $1 million and $4.5 million. Construction of this project required the demolition of 42 units of low-cost housing, including 34 SRO rooms in which residents were paying $417 a month. Is this development a gain for affordable housing? All new social housing units in Vancouver that are guaranteed to rent at the shelter rate are in the Downtown Eastside. Many of these are part of large condominium developments. For example, Sequel 138, a newly completed 79-unit condo building just west of Main St. on Hastings, which recently had one bedrooms advertised on Craigslist for upwards of $1,600 a month, contains 18 units of social housing, 9 of which will rent at shelter rates and 9 at HILs rates. While this is not the place for a full discussion of gentrification, numerous studies have shown that developments such as these put upward pressure on property prices and rents in low-income neighbourhoods, displacing tenants in the process (e.g., here and here). Woodward’s provides a nearby example of such processes, where 125 units of welfare-rate social housing were gained but the climate of investment and gentrification it produced destroyed at least 404 privately owned SRO hotel rooms in the immediate area. At the least, these issues raise further questions as to what extent new “social housing” units will stem the tide of unaffordable housing and homelessness. The good news is that the City has the power to increase the number of social housing units available to low-income people and those on welfare. Seven large projects have been approved or are under construction in which developers will build and transfer to the City social housing as part of rezoning agreements, including Oakridge, 1551 Quebec St., and 1171 Jervis. These projects are slated to provide 780 of the 1,683 social housing units counted in the Report Card. Currently, the City has given firm commitments of shelter rate rents for only 23 of these units, all in Strathcona Village. There is still time for the City to make a much stronger commitment to addressing homelessness by passing by-laws that guarantee the majority of these units will be available to people on welfare and the 38% of renters who make less than $30,000 a year. You can download a breakdown of rent levels in the new social housing units here. Housing Income Limits represent the income required to pay the average market rent for an appropriately sized unit in the private market if no more than 30% of a tenant’s income is devoted to rent. Average rents are derived from Canada Mortgage and Housing Corporation’s (CMHC) annual Rental Market Survey, done in the fall and released in the spring. More info here. Because the City targets a 30% contribution of tenant’s income to rent, a unit being “available” to someone making $36,500 means they would pay $10,950 annually or $912.50 a month in rent. Thanks for the excellent break down Gabe! Makes sense that people who live in poverty might not be able to afford the most expensive city in the country. Note the 30% of income refers to gross not net meaning that this is unaffordable to those on a modest income. The expectation is that people pay over 50% on rent.